Earlier this afternoon Arrow star Stephen Amell tweeted a picture of his upcoming look for tonight’s episode of Legends of Tomorrow. Fans of the Green Arrow comics have wanted to see a goateed Oliver Queen since early on. During the Legends episode “Star City 2046,” an older and more grizzled Green Arrow will be featured along with Connor Hawke. Not only will Ollie be sporting the classic goatee, but it looks like we will be seeing a rematch with Deathstroke. In another attempt to hype up tonight’s new Legends episode the new identity of Deathstroke was released. 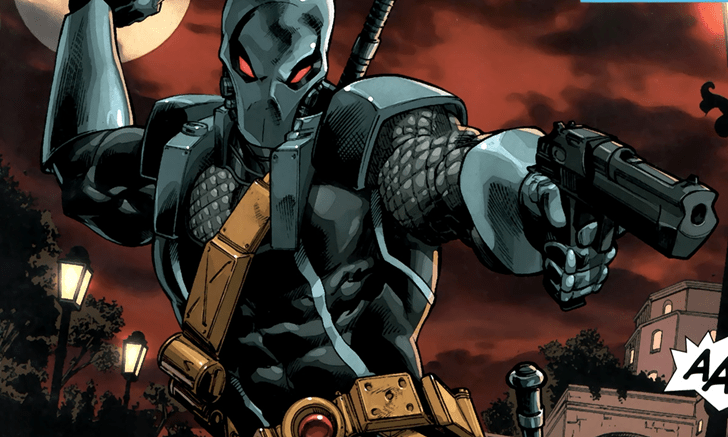 Slade Wilson’s son Grant Wilson will be taking over the helm. Grant was the original Ravager in the comics until he was defeated by Teen Titans. I’m most excited for tonight because of the introduction of Connor Hawke. Could this maybe be just a first appearance for Hawke? I would be quite surprised if Rip Hunter doesn’t try to recruit Connor to his band of misfit heroes. Personally I would not mind seeing the crew of the Waverider add an Archer.